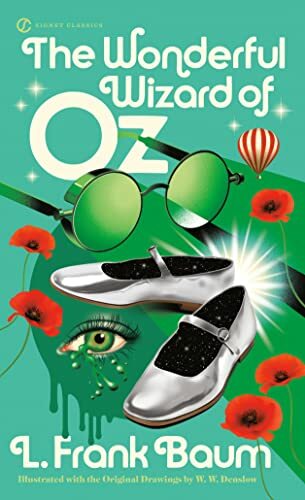 I chose The Wonderful Wizard of Oz, by L. Frank Baum, for the Children's/YA category of the Mixing It Up challenge. I don't read much children's literature (I know, I should turn in my homeschooling card), although I do love many of the classics: Little Women, The Secret Garden, Heidi, Black Beauty, Treasure Island. On the children's shelves in our house are also (unread by me) Pinocchio, Mary Poppins, The Jungle Book, Just So Stories, Swiss Family Robinson, and Oz. I chose Oz from among these for no particular reason except that it was on hand, and that I've always loved the movie. Happily, the movie seems to have followed the book pretty closely. (It always irritates me when movies deviate too much from the books on which they are based.) All my beloved characters are there; their personalities and their adventures are pretty much the same, with a few adventures that didn't make it into the movie. Where he really shines is in his theme. Each character is searching for something that he or she already possesses. Each is looking for someone else to give it to them. We, the reader, see that each has their heart's desire within them already. On the journey to the Emerald City, we see examples of the Scarecrow's intelligence, the Tin Man's emotion, and the Lion's courage, as they help each other along the yellow road. (If we have seen the movie, we also know that Dorothy has the power to go home any time she wants, via the magic shoes.) When they finally meet the Wizard, he is only a man, and can give them nothing that they don't already have. And Baum does not belabor his theme, thank goodness. It's all there in the unfolding of the story and we are not beaten over the head with exhortations to follow our dreams or be true to ourselves as if it were a Disney movie. It's not about "going after what you want;" rather, it's about using your finest qualities in service of others.